Tailored Fit Long Sleeve Casual Shirt,Size XL, Color: Dark Blue. Machine wash. Cotton-blend button-down shirt with basic design. Button front. Buttoned barrel cuffs. Slim fit Point collar Button front. Your source for the top designers' clothing and accessories. Check detail. 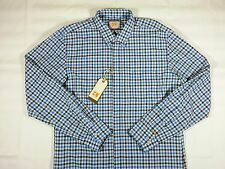 Mens Hugo Boss Lightweight Plaid Long Sleeve Shirt Size LARGE. Condition is Pre-owned. Shipped with USPS First Class Package. Sleeve: 25.75 to 26"" (From shoulder seam to end of sleeve ). Chest: 19" (from arm pit to arm pit). HUGO BOSS RED LABEL. 87% COTTON 13% LINEN. Our selection is valued at up to 80% of MSRP. BLACK COLLAR. FAUX LEATHER TRIANGLE UNDER BUTTONS. Color: Blue and Gray Glen Plaid with Solid Blue Contrasting Flip Cuff. Sleeve (From Midline of Collar): 35". Chest: 25" - Total: 50". Condition: Excellent. Size Large in Good condition. Neck seam to bottom: 26in. This shirt is pre-owned and showsminimal signs of wear. This will aid you in deciding if the item is the right size. Shoulder to shoulder: 18.5". collar to hem: 29". sleeve: 34". A crisp texture marks a versatile sport shirt featuring a smart spread collar and rounded, adjustable button cuffs. Spread collar. Considered a Slim fit; fitted through the chest, armholes and sides. Here's a great shirt from Boss Hugo Boss. Collar to bottom: 29.5". Collar to cuff: 35". Doing that is against U.S. and international laws. 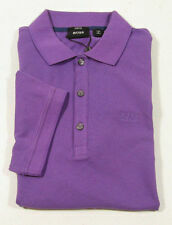 Hugo Boss green polo. Condition is Pre-owned. Shipped with USPS First Class Package. Hugo Boss Brown Slim Fit-X Stretch Cotton Eras Shirt. I WILL WORK TO RESOLVE THE ISSUE. Curved shirttail hem. Collar with hidden snap button. 99% Cotton, 1% Polyester. Armpit to end of sleeve: 21". Shoulder to bottom hem: 31". Add light texture to formal looks with this distinctive design. Kent collar. Extra-slim fit. Short length. Super fast service. HUGO BOSS| Polo. Size: XL | XLarge. Color: Pewter Gray, white. Pattern: Plaid. Length (from back of collar): 31". Material: 72% cotton, 26% polyamide, 3% elastane. Sleeve length (shoulder seam to cuff): 27". Chest (pit to pit): 25". Shoulders (seam to seam): 20". Color: Azzurro Blue - Color code: 475. Style: Polo Shirt. Details: Made in China. 3-Button placket with logo detailing. Ribbed collar and cuffs. Machine wash cold. Top of collar to bottom hem: 29”. M ATERIAL : 80% Cotton, 20% Linen. L ength (collar to bottom): 30" (76cm). Sleeve: 26" (66cm). IZOD Washed Oxford Pink/Blue/White Tattersall Button Front Shirt Size L: good condition. 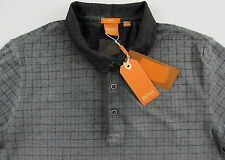 Hugo Boss Sharp Fit Black Button Front Shirt Size 16 1/2 34/35: slightly faded. 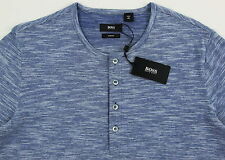 Hugo Boss Red Logo T-Shirt Size L: faded. Has very minor hole below placket, barely noticeable--see last photo. Contemporary Hugo Boss shirt. 94% cotton 6% elastane. Very pleasant to wear, soft and it is very thin. Colors - Brown and tan. Sleeves (end of cuff to shoulder seam). . Chest (pit to pit). .. ~ 23". Length (bottom of rear collar to hem)..